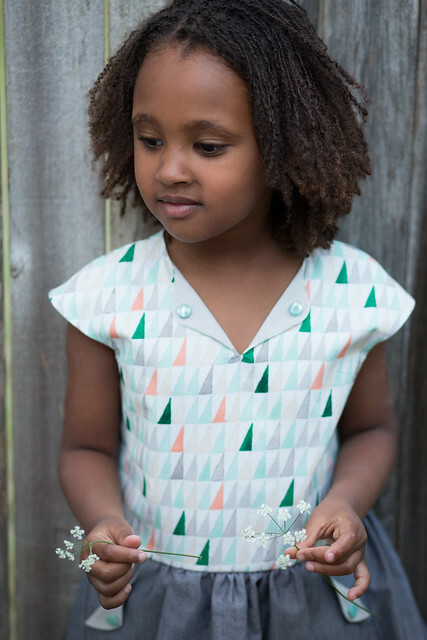 This past week, I had the opportunity to make the Lotta dress, the newest pattern by Marte of Compagnie M (available here). It's such a great pattern. I love the clean lines and modern feel of this dress. The Lotta dress has so many options. There are innumerable ways to mix and match. I really love this pocket option as well. 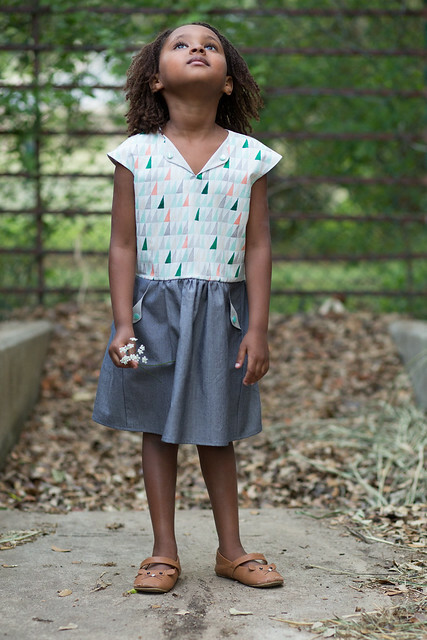 I chose Palos Verdes voile in La Venta for the bodice. I think that entire collection is perfection. I lined the bodice and pockets with a light grey solid I had on hand. 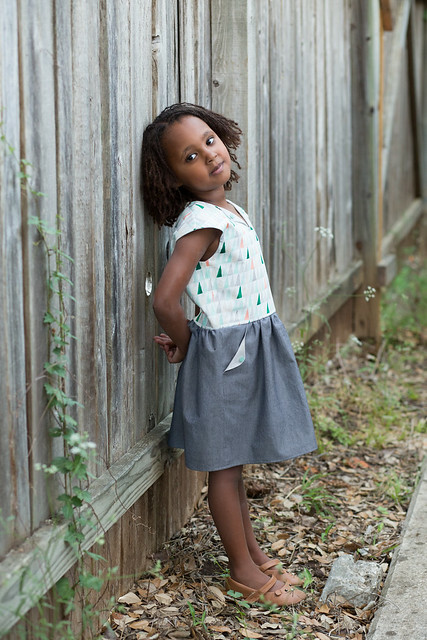 The skirt is Kaufman Carolina Chambray. I went with the button closure for the back. There is another option for an invisible zipper closure. As I was sewing on this dress' nine buttons, I wondered if I should have gone with the zip closure. But I do like this look very much and really don't think you can go wrong either way. Tia just turned 5 and is petite and on the short(ish) side. Based on her measurements, I sewed the size 4. 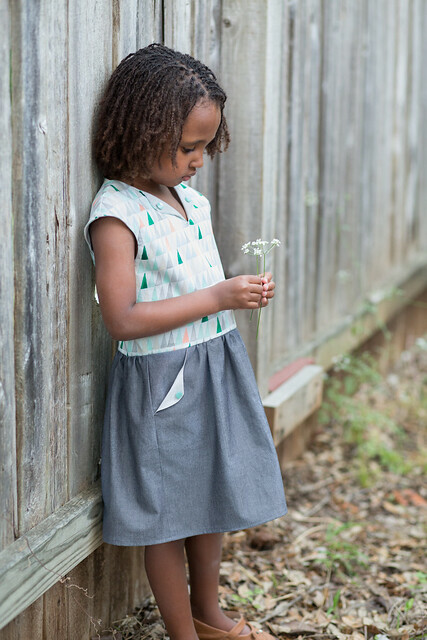 I had to finish the skirt with a very narrow hem to get the length I prefer on my girls (knee length). They grow like weeds and I'd like their dresses to fit for as long as possible. 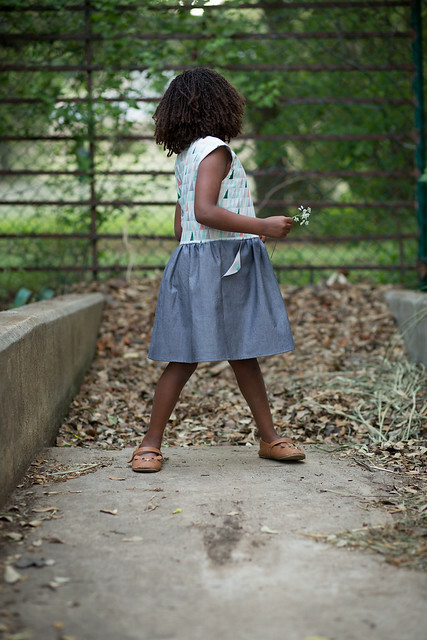 When I make this dress again, I'll probably add an inch or two to the length of the skirt. What a lovely dress and blogpost. I just love everything about it!! Thanks a lot for participating! Can't wait to see it, An! And thank you! Gorgeous! I love it. I agree - I like to make the skirts a little bit longer to get the wear. Very nice pocket details. I think with the narrow hem this worked great, but having a little more length would give more flexibility with the hem. 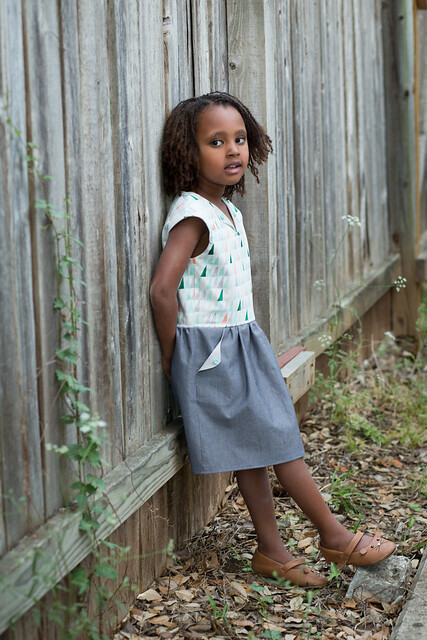 I can't believe how most of the dresses I made for Indigo last fall look like tunics on her now! I'm glad I can pass them along to Tia! What a super dress, I really love the extra modern feel you gave it by choosing these fabrics. Wonderful! I am so so in love with your take on this pattern! While mine turned out to be a very romantic version, this one is so modern and playful. Really really love it! I love what you did with your version. 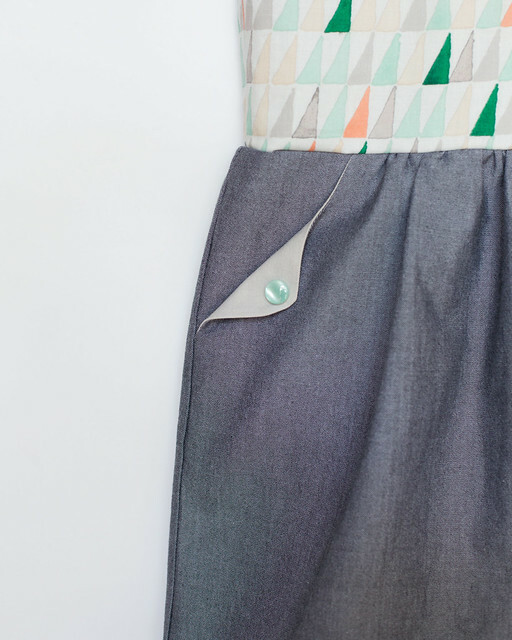 The hem topstitching! The back button placket! It was all so great! oh so pretty! what a lovely pattern, and such a great fabric combination. well done, rachel! Dan said it best. Gasp. Love everything about this. 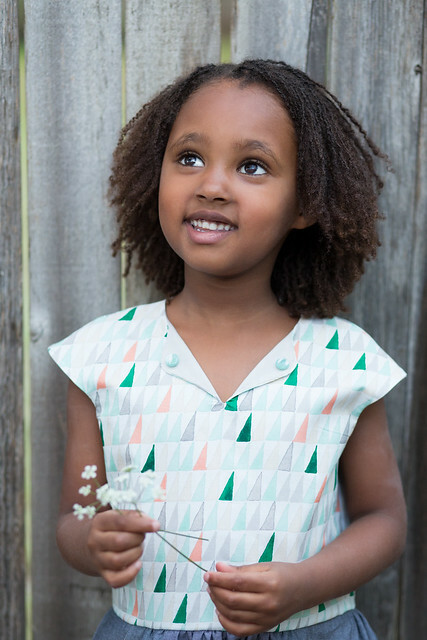 The dress pattern itself but especially your fabric choices and beautiful model. This is just gorgeous! I love your fabric choices - it gives the dress such a different look! Iris Ms. I Do It cracked me up. :-) I have one of those Ms. I Do Its too! But my version currently wants to be naked all the time! That is, unfortunately, generally not acceptable out in public, so it's a battle I have to fight on an almost daily basis. I've taken to saying "if you want to leave the house, YOU MUST WEAR CLOTHES!" because she certainly loves to go places, she just doesn't see the need to cover her cute chubby bod. On the bright side, I get to pinch her nakey bottom all the time, so that's fun. Your fabric combination is lovely! 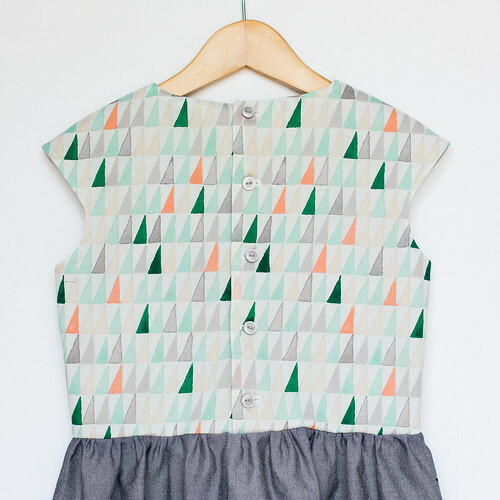 And what fun little features with the neckline and pockets. So sweet! Oh Rachel, you nail it every. time. Amazing. And Tarikua is just the most beautiful girl ever (of course, all your children are beautiful, but T holds a special spot somehow).